In wrapping up a recent conversation with Kiva Zip’s Justin Renfro, I asked him whether there was anything else he wanted to say about the crowdlending platform he helps to run. “Please let more farmers know about us,” he said. It was an offhand request, but a remarkable one. In his mission to connect small farmers and food makers with sources of interest-free capital, his plea wasn’t for more people to write more checks–it was for more people to give checks to. That explains why Kiva Zip recently decided to put more focus on food and farming entrepreneurs. Anybody who lends money expects to get something in return, and if it’s not interest, it is–in the case of Kiva Zip’s army of individual micro-lenders–a chance to satisfy their passion and do some good in the world. And few businesses stir passion like food and farming, especially when it’s local and sustainable. San Francisco-based nonprofit Kiva is well-known for facilitating global microloans–in an effort to help alleviate poverty, especially in developing countries–since 2005. It launched Kiva Zip as a pilot program in 2011 to help a very different constituency: entrepreneurs in the United States and Kenya who aren’t poverty stricken, but just need a bit of help to expand their businesses, buy inventory or purchase a needed piece of equipment. (Kenya is part of the pilot because Kiva already had a strong presence there.) Late last year, Kiva Zip decided to put most of its emphasis on food and farming and this month it helped its 100th farmer secure a loan. By just about any measure, the still-nascent program has been a resounding success–enough to suggest that Kiva Zip could have a profound effect on traditional credit markets, which Renfro said are “broken.” With credit still tight after the 2008 crash, banks and other traditional lenders are rejecting about eight of every 10 loan applications from U.S. entrepreneurs. The majority of the approximately 25 million U.S. businesses that employ five or fewer people are thus left out entirely. All of the loans made to farmers and food entrepreneurs so far have been, or are being, paid back on time. “Not one payment has been missed,” he said. The 100 percent success rate beats Kiva Zip’s overall rate of 89.5 percent (which includes entrepreneurs in other industries). While most of Kiva Zip’s loan recipients are young or new farmers whose credit might not be perfect or well-established, Mark Pasternak and his wife Myriam Kaplan-Pasternak of Devil’s Gulch Ranch are the exact opposite. But their story helps make the case that this kind of financing will be sustainable in the long term–precisely because they didn’t need to go off the traditional capital grid to get the $10,000 they’re asking for and are well on the way to raising. “I already have traditional financing. I have a line of credit,” he said. A $10,000 loan isn’t much, but “it’s a way of getting it started.” He said he believes that after six months or so, the additional retail sales will more than pay for the salary of the person he plans to hire. “You gotta walk before you can run,” he added. But more than that, signing on with Kiva Zip, with the Agricultural Institute of Marin’s endorsement as a trustee, is “very much” a marketing tool, he said, in that it is strengthening and expanding his network. “It helps us interact with more people and it generates awareness” of the ranch. That’s the kind of benefit that you don’t get from a bank loan. Kiva works like this: Borrowers are sponsored by a trustee–a business, a city government, a non-profit organization–that vouches them. The trustee does not guarantee or underwrite the loans, but the seal of approval nonetheless gives lenders confidence. Borrowers must themselves bring between seven and 15 lenders on board (depending on the size of the loan). Those initial lenders might each fork over just $5, but the idea is to demonstrate that they have community support before they take their case to the public. Money is transferred via PayPal and Renfro said the average length of time between a loan appearing on the Kiva Zip site and the time the recipient gets the money is about two weeks. Compare that to the bureaucracy involved in a bank loan. But the main selling point for lenders seems to be the trustees. They provide “the ‘skin in the game’ that can give investors a higher comfort level,” said Amy Cortese, in an email interview. Cortese is the author of the 2011 book Locavesting: The Revolution in Local Investing and How to Profit From It. Trustees usually know and have worked with the borrowers they endorse, which, together with the lenders that borrowers bring on board, represents a community of interest, often locally based. Organizations like the California Farmlink and Seed Capital Kentucky, local governments like the city of Los Angeles, and private businesses like the online grocer Good Eggs have all signed on as trustees. “Kiva and other crowdfunding platforms have found that when a borrower’s own community or network invests, the borrower feels more accountable and repayment rates are therefore much higher,” Cortese said. That’s especially true for locally focused organizations and businesses. “Our interests are perfectly aligned” with those of borrowers, said Greta Caruso of Good Eggs, which relies heavily on local producers. Although she said that the company hasn’t seen any bottom-line benefits from its trustees so far, those will surely come in time. “Mostly, it just feels great. And it fits with the heart and soul of what Good Eggs does,” said Caruso. The company has already vouched for 13 borrowers, who have raised about $80,000. Good Eggs New Orleans endorsed a $10,000 loan for Hollywood Livestock of Port Allen, Louisana to build an enclosed barn and a walk-in freezer. The owner, Garrison Landry, said the loan, “will help our family and business tremendously by giving us more peace of mind with our assets stored properly.” In all, 276 people lent Hollywood Livestock money. It’s hard to know how big an impact Kiva Zip (and similar programs that will surely follow) will have or how sustainable it will be. And when asked whether interest-free crowdlending might turn out to be a fad, Renfro doesn’t hesitate with his answer: “I don’t know.” But given the progress that’s been made, and the enthusiasm expressed by lenders, it could be here to stay. Cortese believes this kind of lending could revolutionize credit markets–not only for farmers and food producers, but for entrepreneurs of all kinds. “I think any consumer-facing business could potentially use this,” she said. 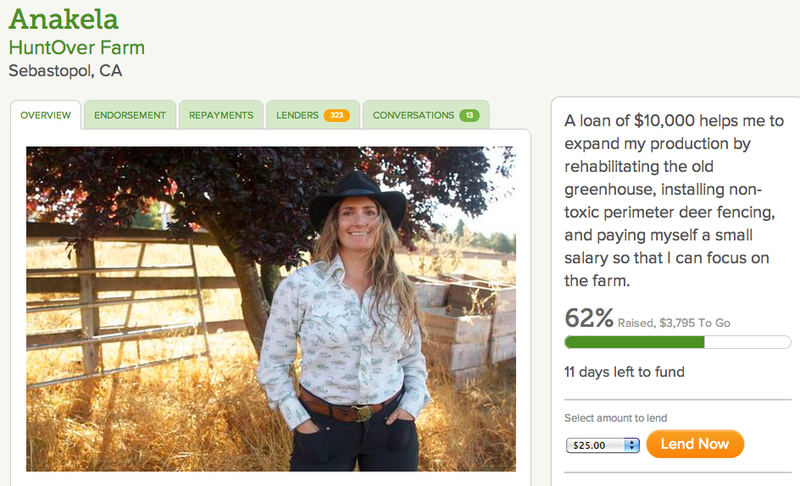 Farmers looking to apply for a loan through Kiva Zip should visit this page.